Years ago, a company I worked for in Australia also owned IPC Magazines, the publishers of NME, Horse, Loaded, The Railway Magazine, Nuts, The Sporting Gun and Wallpaper* amongst others. 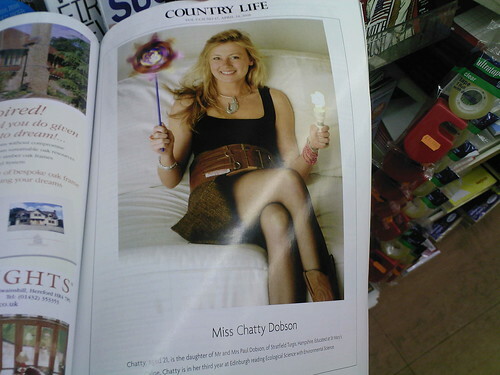 I used to enjoy turning to the “frontispiece” page (AKA “Girls in Pearls” page) of Country Life which we got every month for free (!) to see which young lady was being presented to society. On the way home tonight, I was in the corner store and was a little surprised to see that the 21C debutante still commands a page in the latest edition of CL. This shot of Chatty (Charlotte?) Dobson, was buried amongst dozens and dozens of pages of hyper-expensive real estate ads…no joke, at least the first 60 pages were real estate ads. Chatty, aged 21, is the daughter of Mr and Mrs Paul Dobson of Stratfield Turgis, Hampshire. Educated at St Mary’s Calne, Chatty is in her third year at Edinburgh reading Ecological Science with Environmental Science. It really is a window on another world…but I did like the wind turbine and the compact flourescent light bulb.